LEFT Click your mouse on any LEFT image to view a larger image of the rear artwork. This Maui T-Shirt design was created and screen printed by an internationally, award winning design group in Orlando, Florida. "Maui T-Shirt Destinations", the title of the design, was inspired by a recent trip to Maui. 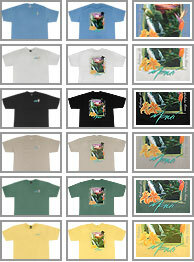 Production of the "Destination Maui T-Shirt" encompasses 14 colors which are expertly separated and silk-screen printed with a simulated spot color process. 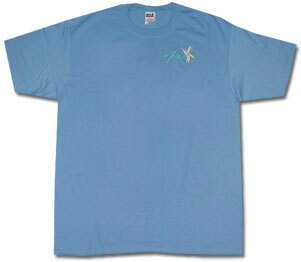 Then all put together on a quality pre-shrunk, 100% cotton Maui T-shirt offered in Black, White, Banana and Aloe-Green. This most attractive design of foliage, and natural wildlife captures the "spirit" of Maui. It is surrounded by some of Maui's most noted destinations; Lahaina, Kaanapali, Kula, Kahului, Makawao, Wailuku, Hana, Kahana, Napili, Wailea and Kihei. Full color Screen Printed back side image. Small color Maui image on front. Featured on the shirt is one of east and west Maui's most abundant forest song birds; the bright yellow-green Japanese White-Eye, (Zosterops japonicus), which from a distance looks very much like the native Hawaiian bird, the Amakihi. The Japanese White-eye at a distance looks very similar to the native Amaki'i. It's easily distinguished however, by the white circle around the eye. The Amaki'i has a black circle. There are no universal size standards in the apparel business. One manufacturer’s large is another manufacturer’s medium, etc. These measurements, shown in inches, on this size chart, pertain to our Screen Printed T-Shirts and Tank Tops, and have no relationship to any other T-Shirt, Tank Top or garment maker, style or brand name.